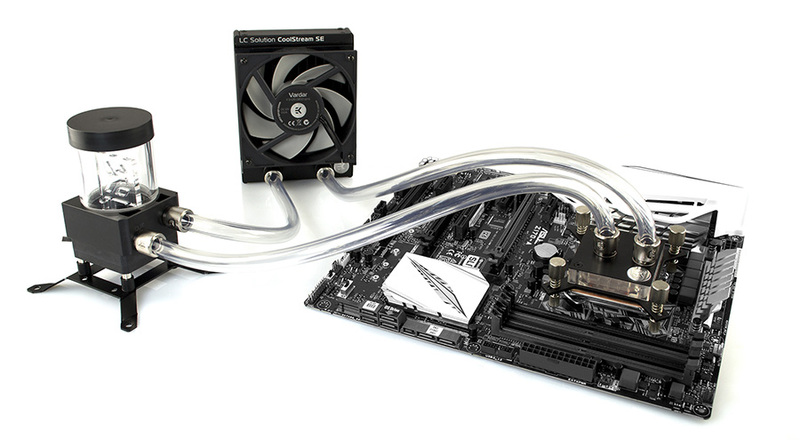 The EK-KIT S120 is a compact starter liquid cooling kits dedicated to all users who seek the best performing, market proven components for highest chassis compatibility. Designed for cases with limited space and a slim radiator in mind, the S kits are a great choice for every liquid cooling beginner and people doing small and mini ITX builds. EK-CoolStream SE 120 radiator - it gives this kit its name - offers best cooling capacity in the 25mm thick radiator class: copper fins provide massive surface area while the parallel flow cooling chambers reduce hydraulic flow resistance to a minimum. Built for EK-Vardar 120mm high static pressure fans, these radiators are optimized for maximum heat dissipation across entire fan operational range thus delivering exceptional performance at both low- and high airflow operation.